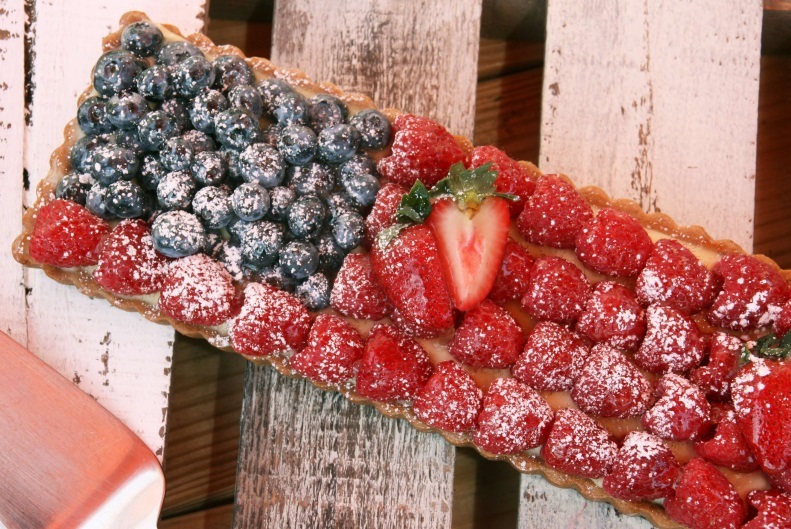 There are times when a dessert just fits into a holiday and the patriotic flag fruit tart dessert is one of them. This dessert is perfect for the Fourth of July but it’s also good for any other time as well. This tart is rustic, sweet, lovely, and the crust embraces the abundant fruit very well. After making multiple flag fruit tarts, you’ll notice that they end up a little different each time, which adds a level of charm. 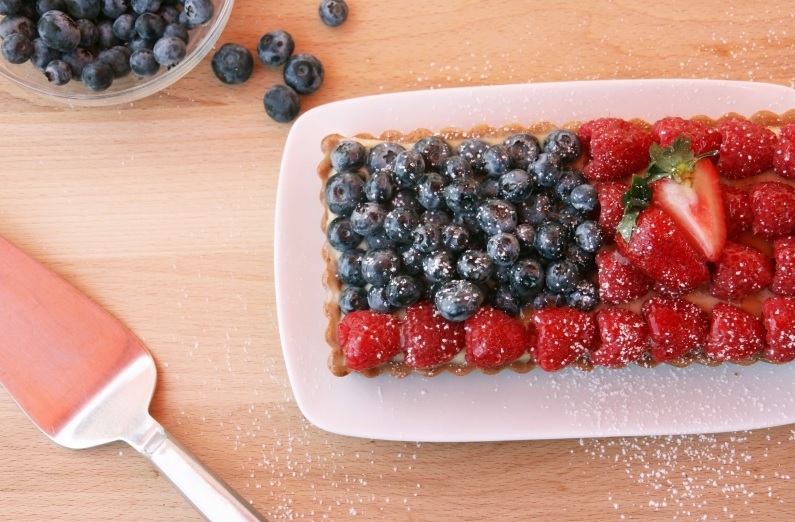 Pair the patriotic flag fruit dessert with ice cream and you’ve got the perfect summer dessert. In the bowl of an electric mixer fitted with a paddle attachment, combine cake flour, all-purpose flour, sugar, and cubed butter. Beat the mixture on low speed until it begins to resemble cornmeal. Add the eggs and continue to beat until the dough comes together. Remove the dough from the mixer and shape it into a flattened ball. Wrap in plastic and refrigerate for at least 2 hours and up to 2 days. Remove the dough from the refrigerator and let it warm up for about 15 minutes at room temperature. Roll out the dough between 2 sheets of parchment paper or plastic wrap to a rectangle that extends beyond the circumference of a 12×4 rectangular pan. The dough should be about ¼ inch thick. Gently fold the dough in half and place it in the tart pan. Press the tart dough into the tart pan with your fingers, being sure to press it into the edges of the pan. Place a piece of parchment paper on top of the dough and fill the shell to the top with beans or pie weights. Bake the shell for 15 minutes, until it is light golden brown in the center. Remove the paper and bake for an additional 15 minutes or until the shell is light golden brown in the center. Let the shell cool completely. Gently remove the shell from the tart pan. Whisk 2 ounces milk in a bowl with vanilla, eggs, cornstarch and half the sugar: set aside. Combine remaining milk and sugar in a saucepan: scald over medium-high heat. Remove milk mixture from heat: temper into egg mixture. Whisk the milk slowly into the egg mixture to bring up the temperature gradually without curdling the eggs. When everything is combined, return to saucepan over medium heat: whisk until pastry cream thickens and is completely smooth, about 1 minute. Transfer pastry cream to a clean bowl: press plastic wrap directly onto the surface. Refrigerate until cold. Can be made ahead and kept refrigerated for three days. Spread about half an inch of pastry cream on the bottom of the cooked and cooled crust. 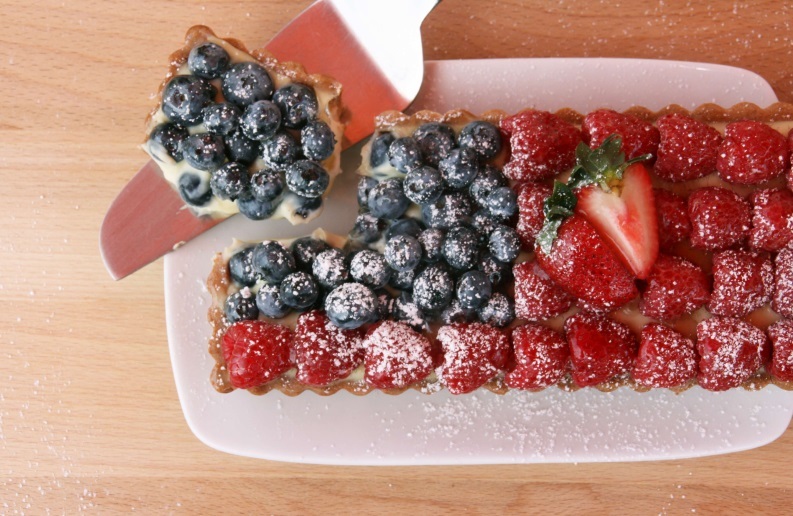 Arrange blueberries and raspberries in a flag pattern. Add additional strawberries for garnish. 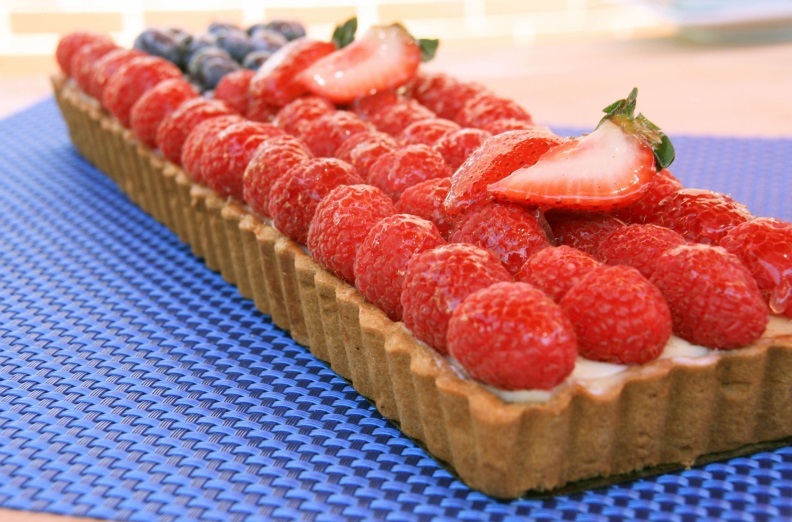 Enjoy this dessert during as one of your perfect summer recipes, or on the Fourth of July. Pair with ice cream or even better, a perfect parfait to take things to the next level. You will surely enjoy this tart enough to search for reasons to make it on any given day.